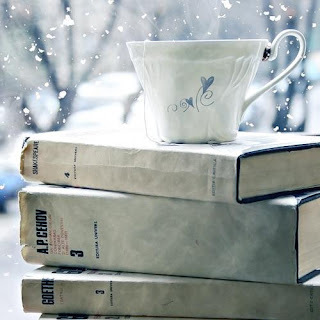 Winter is my favorite season for reading. I live in the Midwest and it gets pretty cold, so it's easy to cuddle up in a blanket with a book and read for hours without feeling guilty. Like a lot of people, I tend to gravitate toward larger tomes around this time of year. Below is a list of books that are on the top of my TBR for winter. 1. How To Read The Air/ Dinaw Mengestu: I've had my eye on this one for awhile and I found it a couple of weeks ago at Half Price Books. It follows two generations of Ethiopians living in America. 2. The Art of Feilding/ Chad Harbach: This was among one of the many books I received for my birthday. Everyone seems to love it, and I plan on picking it up this winter. 3. Alias Grace/ Margaret Atwood: This has been dubbed the most satisfying of Atwood's work since The Handmaid's Tale. I'm pretty pumped for this one. 4. A Man Without a Country/ Kurt Vonnegut: A collection of essays, A Man Without a Country is Vonnegut's last published work. 5. In the Garden of Beasts: Love, Terror and an American Family in Hitler's Berlin/ Erik Larson: Another book that I received for my birthday, it chronicles the life of William Dodd. It's already rumored that Tom Hanks plans to turn it into a movie. 6. Native Son/ Richard Wright: I've had this on my TBR for about a year - it's one of those classics I've always wanted to read but haven't yet. 7. Love in the Time of Cholera/ Gabriel Garcia Marquez: I read Memories of My Melancholy Whores awhile back and liked it a lot. Cholera is the next one I'd like to tackle since I read this Reading Pathways via BookRiot. 8. A Garden of Earthly Delights/ Joyce Carol Oates: I picked this one up at Half Price Books last week, when I was smack in the middle of them and loving it. A Garden of Earthly Delights is the first book in the Oates' Wonderland Quartet. 9. 11/22/63/ Stephen King: So I don't actually own this one yet, but I would like to soon. At nearly 1,000 pages it's a pretty fat one, but the premise is just so tempting. 10. The Remains of the Day/ Kzauo Ishiguro: I've been saving this one for a time when I want to read something a little slower. I've heard it's amazing, and I don't want to pick it up until I'm ready to savor it. I would LOVE to read Alias Grace sometime this winter as well ... I think I own a copy ... I'd really like to read Love in the Time of Cholera too. Maybe I should finish One Hundred Years of Solitude first though. I started it last winter and never finished. Oops. I need to read most of these books sometime (ie I own a lot of them and haven't read them yet!) The only one I have read, Love in the Time of Cholera, I unrecommend, but it was more because I didn't like the style than anything else- if you already like Marquez, then I say go for it! Remains of the Day is one of my top ten books of all time ever ever ever. It's just -ERG, words fail. So good. I need to read some more big books for the Chunkster Challenge. Lord knows I have PLENTY of them on my stacks because they generally scare the crap out of me. However, I tend to read more big fat books in wintertime. I just finished 11/22/63 last night and posted my review of it. In a word? LOVED. I could not put it down and read it in just under a week. So without a doubt, I'd recommend to you to run to your local store and get the book (or run to your e-reader and download it). Man, I loved that story. LOVED. I would love to read a couple, including Love in The Time of Cholera. I've only read the one Erik Larson to date, but he does spin a good tale. As for 11/22/63, it's vintage Stephen King - a bit overlong and bloated in places, but still a fascinating read. I'm so jealous that you get to read Remains of the Day for the first time. So good! You're smart to take it slow and savor it. It's better that way. I may just have to do a re-read over the holidays. I'll be watching for your review of Alias Grace. I have it on my shelf, but it's kind of low on my TBR list. If you really love it, it may just movie its way closer to the top. Enjoy! I discovered while making my "read before the end of the year" pile that it's impossible, so now my TBR is spilling into the new year. I'm eager to read The Art of Fielding too. Enjoy all of these titles! I didn't realize that my post coincided with Top Ten Tuesday. Although, I guess it's a bit different. I really think this is the best time to lounge and read. I tried reading Larson's last, The Devil in the White City, but just couldn't finish. I'm interested to see what you think about this one. Actually, I'm looking forward to your posts on all of these. Enjoy! I am excited about 11/22/63 as well. It reminds me a little bit of The Plot Against America, by Philip Roth, I guess just since both of them re imagine history, albeit in very different ways. Yay for A Man Without a Country and Remains of the Day. I really liked both of those. I just finished In the Garden and it was ok, but not great. What an awesome list. I want to read the majority of those, too, but I have no idea when I'll get to them. I have so many others already piled up. Sigh. I love Remains of the Day, which is slow, but is still a relatively quick read. I completely forgot about the Art of Fielding, which I was so excited to buy brand new a few months ago. There are so many big, fat winter books out right now. Remains of the Day is utterly stunning from word to word. It's incredibly slow burning but Ishiguro's use of the English language is envy inducing. It's one to leave a lump in your throat, too. Glad you're going to read 11.22.63, too. I'm very much looking forward to hearing your opinion! Can't wait to read your take on Love in the Time of Cholera. That's a very ambitious list! "Alias Grace" is the one on my TBR waiting for a time "when I want to read something a little slower" :) Looking froward to your views on it! Yesterday a customer gushed and gushed to me about how much he enjoyed In the Garden of Beasts. I hope you like it, as disturbing as the subject matter may be, as much as he does! I loved Alias Grace, also liked Native Son, and have The Art of Fielding on my list, too. Looks like you're reading it now. What do you think so far?